Thanksgiving. The time of the year to reflect on all that we are thankful for. Yet, for some reason, this year my heart is quite burdened. While I truly am grateful for so much in my life, my heart can’t seem to break free of bearing the burden of so many close to us that are traversing through challenging times. Cancer, illness, wayward children, suicide, financial hardships, addiction, bitter relationships…and all of that is just within the walls of my circle of friends. Mingle in the sinful, divisive climate that bathes our society, and you have cause to feel the weight of the world. Waiting patiently has never been one of my best attributes. My trouble started early on. As a child, I always knew where my mother kept our Christmas gifts hidden, and I made it a point, with great regularity, to spy and peek at the stash. I simply could not wait until Christmas. For the past several days I have been contemplating the time that Jesus spent in the Garden of Gethsemane praying. I’ve been struck by the words that scripture uses to tell us about the emotions of that evening. I’ve combed through various Bible translations noting these words. My Father, if it is not possible for this cup to be taken away unless I drink it, may your will be done. It seems that as each Easter season comes and goes, the Lord allows me to look at the accounts of Christ’s death, burial, and resurrection with new eyes, each time, He meets me where I am, addressing my issues, my struggles, and putting them into perspective. This year Easter reminds me of my Savior’s ultimate desire for the Lord’s will to be accomplished regardless of the cost. The cost was great. Arrest, mockery, physical beating beyond our comprehension, crucifixion, betrayal, abandonment, and death. Greatest of all was the separation from His Father due to the sin that was placed upon Christ. He willfully submitted to all of this because the Father’s will was best. Is there any part of God’s will that I would be hesitant to accept? Would I be willing to go where He leads? Would I be willing to stay where I am? Would I be willing to change course, step out of my comfort zone, and allow His perfect will to unfold? Am I willing to wait? Am I willing to accept the Lord’s will for my life? As I said, the Lord has a way of putting things into their proper perspective. As I contemplate what my Savior endured, as I allow the pain of His experience to truly penetrate my heart, as I realize that His willingness to submit, to suffer, and to die was for me, I am left realizing that anything, simply anything that I must endure in this life is nothing compared to what Christ voluntarily endured for me. This Easter I am humbled by my Savior’s submission to His Father’s will. I am left in awe of His great love for me. I am moved beyond words as I contemplate the cost involved in bearing the full burden of my sin. Oh, what a great cost for such an undeserving, yet ever so grateful soul! And though my words simply cannot suffice, I thank you Lord Jesus for following your Father’s will. I am prone to negativity. When my tongue is unrestrained it lends itself to complaining, biting sarcasm, and criticism. How’s that for a dose of honesty? Similarly, my thoughts can easily meander down the same pessimistic path. I’ve needed to fess up to this less-than-Christlike attitude and confess it for what it is: sin. I am prayerfully working on changing my perspective. Decades of pessimistic practice have made this a hard habit to kick. But I am thankful that the Lord has opened my eyes to it and given me the opportunity to change. I find that when you prayerfully ask the Lord to help you put off an old way and replace it with a new, more Christ-like way, He’ll provide plenty of opportunities for practice. Sometimes it’s not the practice we want. We simply want change to occur without the practice part. We want a snap-of-the-finger kind of change. A wake-up-the-next-morning-and-be transformed kind of change. Yet, most often, this is not God’s recipe for true and lasting change. Ever pray for patience? Ever sorry that you did? God has been faithful and has provided me with plenty of opportunities for practice in this area. He’s given me the opportunity to choose between searching for the silver lining in situations or the dark stained mire. Back in November my oldest son accepted a seasonal job in a neighboring town about 15 minutes away from our home. The business was located on a major highway not far from a very large mall. Most days my son needed to arrive at work between 4:30 – 5:00. Rush hour. Traffic. Dinnertime. Christmas shoppers. That’s all that I could think of. I honestly was not looking forward to the back and forth. It was just one more thing added to an already busy day, at a time where my day was supposed to be winding down from school. On my son’s first night of work, we drove past a small, local airport and were greeted with the most spectacular sunset. Both of us were taken back by its beauty. Normally at home, sunsets are obstructed by trees and homes, allowing us to only catch a small glimpse. Yet the openness of this airport allowed us to absorb the radiant beauty. What a blessing! You know what? This scenario repeated itself nearly every evening that my son needed to work. Each sunset seemed more splendid and glorious than the one before Each opportunity for alone time with my son grew sweeter. It didn’t take long for me to realize that the Lord was providing the opportunity for me to make a choice: focus on the craziness or find the silver lining. I opted for the silver lining. My husband is an early riser, not by choice, but by necessity. His work day begins at 6:00am, so he is up at 5:00 and out the door by 5:45. I am not a morning person, but for the nearly 22 years of our marriage, the Lord has prompted me to get up with my husband each morning. Take my word for it, it’s not always pretty. Messy hair, morning breath, and mumbled words usually are the norm. I know that my husband appreciates a smiling face, a shared prayer, and a hug and kiss goodbye. Those early morning wake up calls are worth it. Sometimes in the dead of winter I have a really difficult time getting out of bed that early. It is so dark and so cold. The warmth of the comforter and the magnetic pull of the snooze button call to me. I resist, and I get up. One morning after my husband had left for work, I stood zombified in my kitchen, staring aimlessly out the backdoor. I was greeted with a beautiful painted sky full of reds and pinks; it was simply gorgeous. I began to wonder how many of these brilliant displays I had missed because I was too busy focusing on my fatigue. So each morning I made it a point to watch out my back door to see what beauty the Lord would reveal. Nearly each morning I realized that there was beauty to enjoy: a colorful sunrise, the peaceful silence of falling snow, the calling of a bird, even a lunar eclipse – all things I would have missed had I been asleep. The Lord was providing me with opportunities to shift my focus. Would I continue to focus on my tired state or would I find the silver lining? I opted for the silver lining. My mother has dementia and is no longer able to stay by herself during the day. My brother, her primary care provider, and I discussed our options. We concluded that it would be best if I pick my mom up from my brother’s place of employment each weekday morning and have her spend the day with the boys and me. This new set up meant no more breakfasts with my boys, a late start to school, and the potential for major disruptions during the day. My mom and I have history, and our relationship through the years has been strained. While I’ve worked through these issues, I am still keenly aware of her tendencies. In my heart I knew what needed to be done, but in all honesty, I did some silent kicking and screaming. Each morning I make the one-hour, round trip drive to meet my brother, pick up mom, and head back home. Driving alone has always been a much coveted time. Those rare solitary drives give me time to think and pray uninterrupted. After a few days of making the drive to pick up mom, I began to realize that the Lord had just offered up a daily invitation to spend time with Him each morning. So now most mornings I spend my 30 minute drive talking to my Heavenly Father. Uninterrupted. Quiet. Meaningful prayer time. So again, the Lord provided me with a choice: complain each morning or find the silver lining. I’ve opted for the silver lining. I don’t always opt for the silver lining. Sometimes the silver lining is not easy to see because the mire can be thick and the pull toward negativity so strong. But the Lord has shown me that when we let negativity be pervasive throughout our lives, we allow satan to dictate our day, not Him. We allow opportunities for growth to be thrown to the wayside. We perfume the atmosphere with a stench that affects all those around us, pulling them down into the mire alongside of us. We become the darkness not the light that we as Christians are called to be. Is negativity a problem for you? Find yourself complaining, griping, and criticizing on a regular basis? I would encourage you to bring this before the Lord in prayer. Pray that He will allow you to see this tendency for what it is: sin and a tool of satan to drag you down. The Lord has far greater plans for you, and with His help, you can change. For quite some time I have been feeling the not-so-gentle-nudge to do something about this blog, Life in the Van. I cover such a broad range of topics from faith to family to food, and in the blogosphere, that is no good. Those of you who are interested in reading more about topics related to faith and family may not necessarily be interested in my recipe posts. Conversely, those of you looking for new recipes may not be interested in hearing about my thoughts on matters of faith and family. So, this past week, I fixed that. I have a new blog up and running called The Gluten Free Gathering. Here, I will be posting only gluten free recipes and other food related topics. 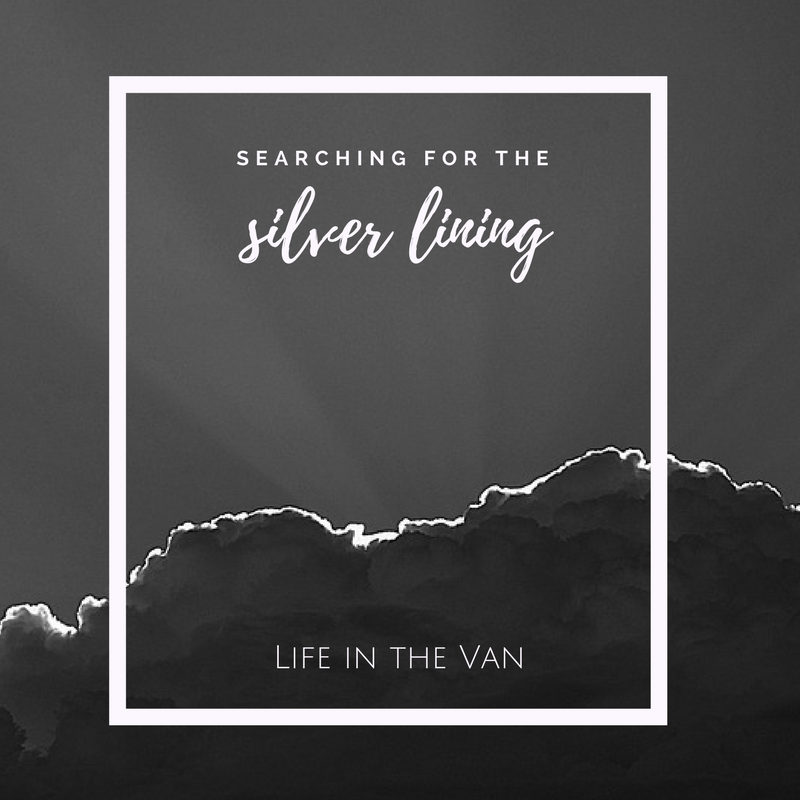 Life in the Van will remain the place where I share what the Lord has laid upon my heart. I will be sharing matters of faith, lessons, and family topics as I always have. If there are any cooking contest adventures, I’ll share those as well. But soon you will begin to see all of those yummy recipes disappear from Life in the Van. They will find a new home at The Gluten Free Gathering. If you want to pick up some great gluten free recipes, head on over to The Gluten Free Gathering and sign up. 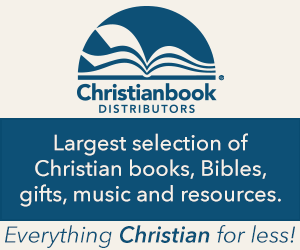 You can also visit us on Facebook, Instagram, Twitter, and Pinterest. We’d love new followers! If you want to hear more about faith and family, stay right where you are at Life in the Van. Life in the Van does have a Facebook page as well. Thanks to all of you who have followed and supported me in my writing venture. It’s something that I truly love to do. Life has been busy and complicated of late. Seasons like this sprinkle the timeline of our lives like snow (sometimes like a blizzard). Busy doing what needs to be done…what has to be done. Running to and fro. Dealing with the challenges life has. Aging parents. Health concerns. The future. It seems as though everything else gets pushed aside. Our good intentions become just that, intentions; things dreamed of or planned, but never coming to fruition. The out-of-control elements of the day dictate its course. Sometimes we simply feel like we are bobbing on the waves, being pushed to and fro, struggling to keep our heads above, at the mercy of the tide. But then there is Christmas. And there is Christ. The reminder that the God of all the universe is mindful of me. He knows of my struggle. He knows my frame. There is the reminder that through it all God has a plan. He has a plan and purpose for all of the ups and downs of this life. He is in control and always has been. Nothing comes to pass in my life that has not already been permitted by His hand. Permitted for His purpose, ultimately for His glory and my refinement. And in the times where doubt grips my soul, in the moments where I wonder if God is there, is He hearing, is He seeing, does He know, I am reminded that God has always had a plan since the dawn of man, since His beginning, of which there was none. He heard the cries of His people. He saw their great need for redemption, and He knew the course that needed to be taken. He always had a plan, and that plan began with Christ. This Christmas I am reminded that God has a plan. His plan not only meets the challenges of my day but my greatest need of all. This plan to bring a Savior is the heart of Christmas. It is the coming of Christ. It is God in human form, coming to live among men, coming to die, coming to conquer sin and death, coming for me. So if this season, be it the Christmas season or this season of life, has you wondering if God has a plan, know that yes indeed He does. His plans are unfolding with each new day, with each new breath He gives. He sees the grand picture and is piecing it together in His perfect timing, in His perfect way. Let this Christmas be a reminder that God, who has orchestrated the redemption of my soul, is working out His perfect plan in this day and the days to follow. Our family has always enjoyed having a real Christmas tree in our home. There is just something about the fresh smell of pine that draws each of us in. We typically frequent a local garden center to select our tree. But one year we ventured out to a tree farm to cut down our own. Unfortunately, I was unable to go because of a commitment at church, but my husband and boys joined my brother-in-law and his children on a tree-cutting adventure. I remember the day well; it was very cold and snowy. My husband and I rushed around to find warm clothes, gloves, and hats for the kids; I was trying my hardest to get out of the house on time while looking somewhat pulled together. We went our separate ways, which I must admit made me very sad. I knew that I was going to miss out on some family fun. Later that afternoon we all met up back at the house. The boys were very proud to show me the tree that they had selected and cut down themselves. It was covered in a blanket of powdery snow and tightly bound in netting. We placed it into a bucket of water and left it out on the porch to dry for a few days. In short time we prepared our living room and made room for our tree. Each of us had waited with great anticipation for tree decorating day. When we went to bring the tree inside we noticed a number of insects flying about on our porch. Normally, there aren’t any bugs flying about on a cold December day in New Jersey. We took a closer peek and found that our tree was housing quite a number of bugs. After my husband broke the news to the boys that we were not going to decorate the tree that day, he asked me to meet him in the backyard. He then told me that we needed to unwrap the tree and shake it really hard. We did. Then we began to bang the tree up and down on the stump. Finally, for good measure, we tossed the tree around the yard a few times. I can only imagine what our neighbors thought. We live in a neighborhood where all of the homes are within close proximity of each other. What a show we put on for them! Regardless, we gave that tree a good shaking and hoped that we had evicted all of the insects. The next day we set up the tree and enjoyed our decorating time together. The tree was beautiful. It was full, lush, and perfectly symmetrical. It was just about the most perfect tree anyone could hope for. 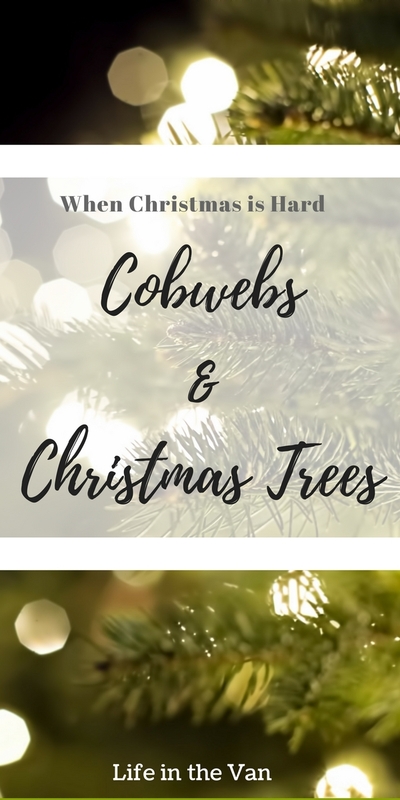 Soon after our decorating day, I began to notice a few cobwebs beginning to form in various areas of tree. I swiped them away as best I could. I hoped that the lights and ornaments and all their sparkle would cover over the cobwebs so they wouldn’t be noticeable. Christmas is supposed to be full of beauty and happiness and joy, right? There’s no room for spiders and cobwebs. However, every few days new cobwebs appeared. I continued to brush them away. I finally broke the news to the boys that the tree would need to go out to the curb the day after Christmas. So, as promised, we undecorated our tree on December 26th. Once all of the ornaments and lights were removed, we could clearly see the magnitude of the problem. There were spider webs all throughout the tree, on every side, on the top, on the bottom, on the outside, on the inside. Everywhere. Our Christmas tree looked like a twisted scene from a scary horror movie. We quickly sent the tree to the curb for pick up and promptly began cleaning the living room from top to bottom. It’s was all rather funny…that is except for the small yellow spiders we found throughout the house for the next year. Our cobweb filled tree serves as a good reminder to me that sometimes underneath all the glitter and lights of Christmas, something is hiding. For many, sadness and loneliness are a regular guest at Christmas. While most are busy laughing, smiling, and being merry, many people are left trying to swat away the cobwebs that keep reappearing. Relational problems, financial stress, sickness, the absence of a loved one, and loneliness seem to be magnified during the holidays. What should be a joyous season is often one of the hardest to endure for many. This Christmas season I would encourage you to be on the lookout for ways to extend love to those who are struggling to swat away cobwebs. We often know who they are, but in the awkwardness of the situation, we rarely reach out. Take the time to embrace someone and acknowledge their sadness. Share their burden. Cry with them, encourage them, show them the love of Christ. Open up your home to someone that you know will be spending the holiday alone. Wrap a simple gift. Make a homemade treat. Invite someone to church to hear the good news of Christmas. Remind someone that you will be praying for them. I’m reminded that Christ came so that one day the sadness, loneliness, and hardships of this world would be no more. He came as a babe to be victor over sin and to give us hope. He came to bind up our wounds, dry our tears, and to save us from the depravity of our sin. So while we share this life together where happiness and sadness mingle together, let’s be light, let’s offer hope, let’s extend love, let’s share Jesus to the people who need it most.